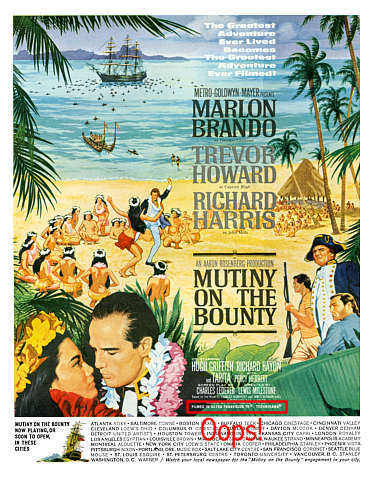 Metro's third production in the process was the 1962 remake of their 1935 Oscar winner Mutiny on the Bounty. 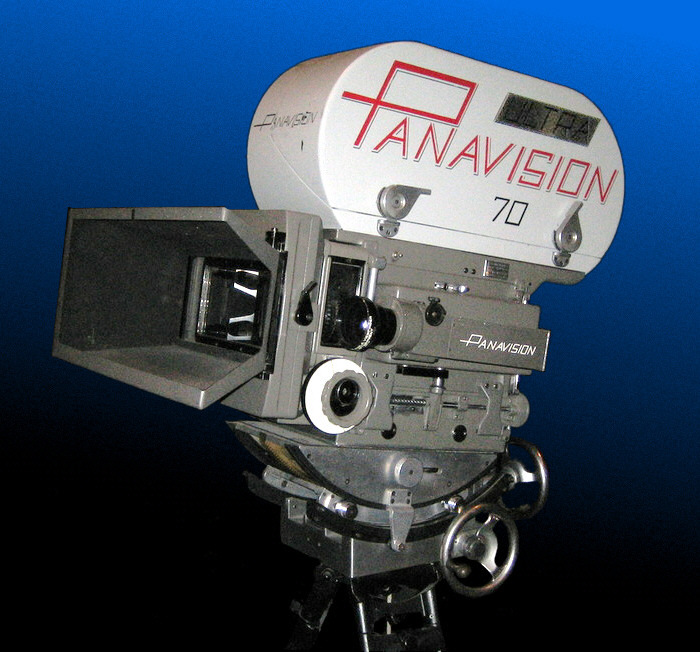 Panavision had made refinements by designing new optics using cylindrical anamorphic elements, reducing weight and size of the lenses, new self blimped cameras were built from the ground up rather than being thirty year old units or Mitchell 35mm models adapted to handle 65mm film, though a number of the Mitchells would remain in service for several years seeing duty in Mutiny on the Bounty, Lawrence of Arabia (with spherical lenses dubbed Super Panavision 70), It's A Mad, Mad, Mad, Mad, World and several others. Note that the poster at left shows Trevor Howard's Captain Bligh with a guacamole complexion, indicating that this is not a good man to go boating with. Then again, maybe it's a breadfruit complexion. 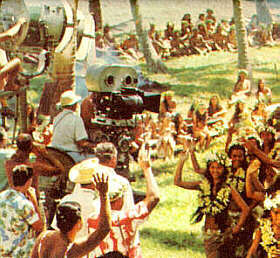 Ultra Panavision's new cameras and lenses (right) photograph native Tahitians, only a small percentage of which were impregnated by Marlon Brando. Robert Surtees again directed the lush photography of this underrated tale of the famous mutiny. For this and all subsequent productions, the process was credited as Ultra Panavision 70. M-G-M had sold off its camera department to Panavision and Gottschalk's name was finally used rather than the unimaginative Camera 65. Though Ultra Panavision 70 would be used on a number of later productions, all but one of which would be shown in the bastardized 70mm version of Cinerama, Mutiny on the Bounty would be M-G-M's last picture using the anamorphic process. They did utilize it for certain sequences in How The West Was Won, but some of those scenes were lifted from 1957's Raintree County. Mutiny on the Bounty would also have the distinction of being the last Ultra Panavision 70 film to be shown using anamorphic prints. Filmed in Ultra Panavision 70. On its third production the process finally appears under the name designated by its designer back in 1956. This film, like Cleopatra, suffered from continual bad publicity during its production that ultimately cost big at the box office. Also, like Cleopatra, it's a much better film than generally credited. These frames were taken from an HD transfer from the camera negative using the incorrectly accepted aspect ratio of 2.76:1. Director of photography Robert L. Surtees was justifiably nominated for an Academy Award for his lush photography of this tale of the sea. It was the third of four films the acclaimed cinematographer would shoot in the process. The Oscar went, however, to Freddie Young for his equally beautiful photography in the diametrically opposed environment of Lawrence of Arabia photographed in Super Panavision 70. 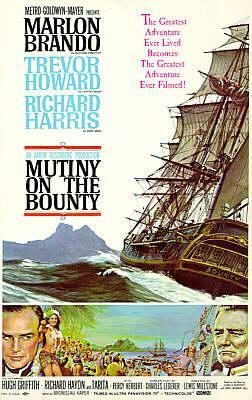 Like Ben-Hur before it, Mutiny on the Bounty was shown with a screen ratio of approximately 2.55:1 in its 70mm roadshow run. MGM's publicity department makes a unique slip-up. This full page ad apparently appeared only in LIFE magazine. It features an odd mistake in the photographic credits. The film was NOT photographed in both Ultra Panavision 70 and Technirama. It was supposed to say "Technicolor". Those desiring to review the list of theatres at the bottom of the ad may find it reproduced at a more readable size in the Roadshow section. Further discussion of Ultra Panavision 70 appears in the Cinerama wing.